Takayasu is one of the most famous restaurants in Kyoto, located a 5-minute walk from the Eizan Electric Railway Ichijoji Station. The restaurant’s main claims to fame are their painstakingly prepared creamy, cloudy chicken or pork-based soups, their large curry-flavored karaage(Japanese fried chicken), and the almost excessively generous servings of rice. Befitting a famous restaurant, it is always extremely crowded. The interior has a trendy café-style atmosphere, and many women come here for solo dining. Takayasu’s basic ramen. The soup is creamy and extremely light. Compared with other Kyoto ramen shops, it may seem a bit thin, but it is very flavorful, so it packs more than enough deliciousness on its own. If you feel like it’s missing something, try adding a little of the hot and spicy nira on the table. The flavor of the soup will enhance the spiciness, giving it more punch. It is extremely spicy, so be careful not to add too much. Their famous curry-flavored karaage. They are boneless, tender, and quite big. Takayasu’s ramen is light, so it pairs well with the stronger seasoning of the karaage. Look at the size of that! At Takayasu, you can order rice for ￥170, but you are free to set the portions yourself. If you order the L size, they will bring you a mountain of rice the like the one in the photo, so we recommend M size for men and S size for women. 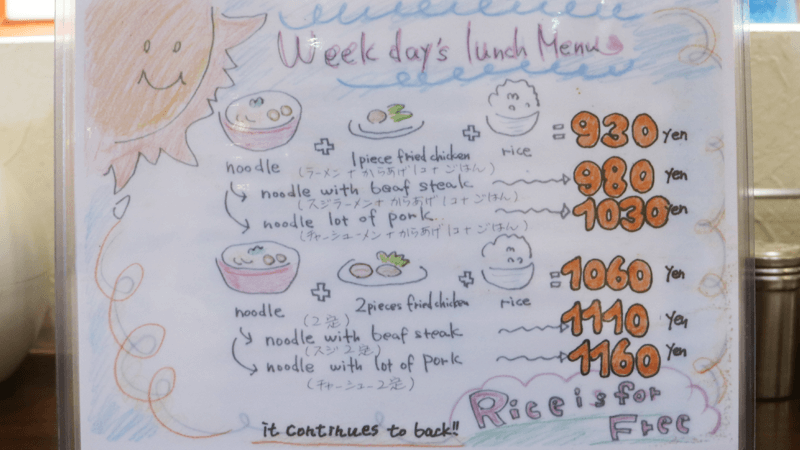 The Noodle with beef steak is the most popular dish among local ramen lovers. It is the regular Takayasu ramen with beef steak and slightly sweeter seasoning. It may look rich, but it is not too heavy, and the flavor is different from the regular soup. You should order this if you like stronger seasoning. 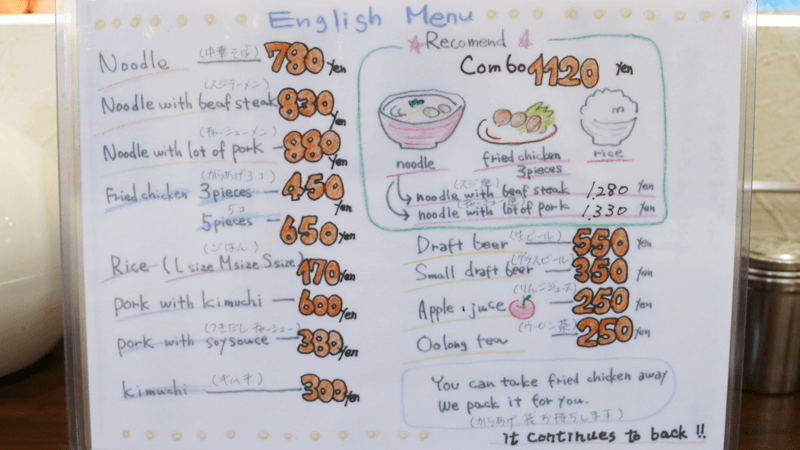 If you speak to the staff in English, they will give you the English version of the menu, so you can look at that to make ordering easier. You select the type of ramen first, and if you need rice or karaage, you order that at the same time. At lunch time, the set menu offers good value, so you may want to consider it. The ramen is delicious, of course, but personally, I think you should definitely have the karaage. The aroma of the oil and the curry flavor are addictive. If you get full and have leftovers, the staff will wrap them up for you take home. That thoughtfulness is a nice touch. Takayasu’s ramen looks heavy, but it has a light, fresh flavor which makes it perfect for women who like to avoid greasy foods. For men who might not be satisfied by the lighter flavoring, I recommend the Noodle with beef steak. It would be remiss of me to talk about Takayasu without mentioning the karaage set meal. The combination of curry-flavored karaage, ramen, and a heaping serving of rice is great value for the money and sure to satisfy! 5-minute walk from Eizan Ichijoji Station. Extremely crowded from 12pm to 1pm, with waits of 30 minutes to 1 hour. Staff can respond to simple English.